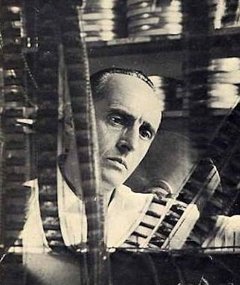 A leading proponent of cinema as a chiefly visual medium, René Clair began his directorial career in the midst of the silent era, honing his craft at a time when filmmakers had no choice but to tell their stories without the benefit of sound. Like so many of his contemporaries, he met the arrival of the talkies—and with them the movement known as filmed theatre—with determined resistance, continuing to craft films primarily centred on images rather than sounds, incorporating this new technology to only a limited degree. While his efforts were, whether through his own endeavours or those of the filmmakers he influenced, eventually successful with cinema gradually acheiving recognition as its own artistic medium, Clair himself remained largely forgotten. As Dowrie and Reader rightly lament: “Clair’s work may now appear slightly fey and insubstantial, but the unusual verve of À nous la liberté in particular, and its satirisation of the nascent modern entertainment industry of which the film is itself an example, do not deserve the neglect into which they have latterly fallen” (8). To best appreciate Clair’s antithetical relationship to the philosophy of filmed theatre, one must first consider the emergence of that movement as both a response to the introduction of sound to cinema and a reaction to the threat its popularity posed to France’s traditional theatrical culture. Playwrights like Marcel Pagnol, with films the like of Marius (1931), met the new challenge of sound cinema in a manner best described by Collignon:“They crossed over from the stage to the screen, but with all the tricks of their trade. And here was precisely the stumbling-block: afraid, rather childishly really, that the theater would be swallowed up by the movies, they wanted to devour the latter. The result is well known; it is the filmed theater with its errors” (35). Those errors, of course, involve a willing disregard for the ontology of cinema; a direct rejection of those aspects that make cinema unique as an artistic medium. In doing little more than staging their plays before a camera and filming them verbatim, these directors sought to establish the cinema as merely an extension of the theatre and its art rather than as a form of expression in its own right. Clair, by contrast, emerged from the milieu of silent cinema, his background thus in a form of storytelling that directly relied on the visual nature of the medium for narrative and stylistic expression. Indeed, Clair’s early career is defined by its determination to explore the possibilities of a (then still relatively) new medium; as Dale writes: “Clair was eager to preserve the integrity of cinematic form. But nobody, including Clair, was entirely sure what that elusive substance was” (638). His surrealistic debut short Entr’acte (1924) predates the formalistic experimentation of Eisenstein and Pudovkin, as well as the most accomplished later works of German Expressionism, in its vivid efforts to define the possibilities of cinematic storytelling. 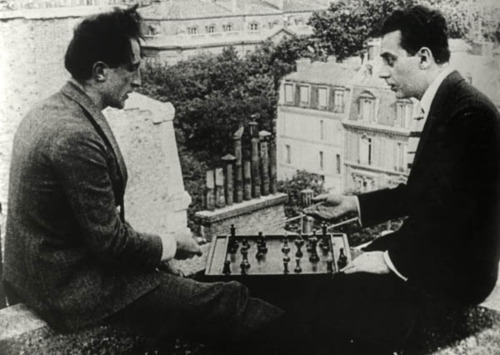 A defiant exercise in Dadaism with Man Ray and Marcel Duchamp, key members of the movement, making brief appearances, Entr’acte’s surreal tendencies belie an earnest interest in establishing the potentiality of the film camera. Clearly foreshadowing the distinct style of balletic movement he will come to apply to more traditional narrative structure with À nous la liberté (1931), Clair’s direction in this early work is everything that the filmed theatre is not, serving as a rumination on the inherent qualities of the filmic medium and an energetically playful exploration of its “magic”. Its story, insofar as the loose assemblage of events that occur in the film can be thusly dubbed, concerns a sprawling funeral procession that concludes with the deceased breaking free from his coffin and dismissing each of the attendees with the wave of a wand. Clair’s use of stop-motion trickery to visualise these disappearances, as well as to animate a cannon and other inanimate objects throughout the film, recalls the earliest efforts of Georges Méliès to exploit the illusionary capabilities of cinema, and joyously celebrates film’s fantastical qualities. Unlike Méliès, however, who was content to practice his art within the confines of studio sets, Clair exuberantly embraced the mobility of the cinema; indeed, motion and the space it utilises are perhaps the most distinct aspects of his unique style, his peculiar notions of the importance of movement indebted far more to dance than to theatre. The visual artifice of Clair’s earliest work considered, it is little surprise that he should meet the introduction of sound cinema, and particularly the ensuing development of filmed theatre, with pointed scepticism. Standing in stark opposition to the vivacious choreography he had been instrumental in establishing as paramount to cinema’s artistry, the films of Pagnol and his cohorts relegated the new possibilities the camera brought to the sidelines as they transposed the theatrical aesthetic to the cinema, thus confining movement to small spaces as upon a stage. Clair’s rejection of this spatial relegation is seen nowhere better than in À nous la liberté, which prominently features both expansive exteriors—the film’s concluding scene, for instance—and grandiose interior sets designed by Lazare Meerson, on which Clair is allowed the freedom to enact his extravagant sequences. 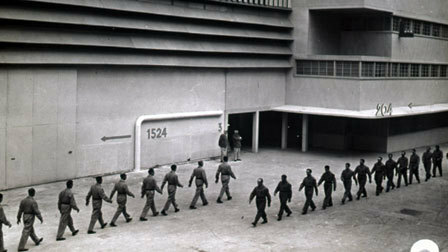 Our introduction to the prison in which the action begins, for example, comprises a striking confluence of inherently cinematic techniques, the deft movements of the camera and notable depth of the image—we observe action occurring on multiple background levels—combining to communicate in detail the constitution of this space. Indeed, the manner in which Clair implements this vibrant visual action brings to the film a pulsating rhythm akin to ballet; as Andrew summates: “curiously it is by emulating dance aesthetics that he could champion a notion of pure cinema through the phrase “cinema of pure movement “” (57). It is important to remember that while Clair clearly sought to establish his as a cinema diametrically opposed to the tenets of filmed theatre, his attitude to the new sound technology was not entirely negative. Despite Dale’s arguably accurate supposition that “Clair refused even equal opportunity to sound: his art remained visual; sound had only been admitted begrudgingly, under economic pressure” (639), we can see in À nous la liberté an aural experimentation not unlike the visual experimentation of Entr’acte, whereby Clair strives to find a suitable place for dialogue and sound effects within his work. Perhaps best seen in the film’s memorable theme song, À nous la liberté affords ample opportunity to sound technology to add to the film, employing dialogue as a means of convenient plot exposition and narrative furtherance. The visual composition of the film may remain its most important stylistic component, but sound is exploited as a means by which to enrich and enhance this, Clair wisely using the new technology to his advantage. At the same time, however, he cleverly uses his soundtrack to reflect upon itself, playing with certain aspects of the film’s diegetic sound to pass comment upon this new addition to cinematic language. Undoubtedly the film’s most intriguing implementation of sound is in an early scene where Émile, the prison-bound protagonist, observes a beautiful girl singing a melodious tune; or rather, that is what he thinks he observes: Clair subverts this pairing of sound and image with a cut to a phonograph playing a record from which the music truly emanates. Standing as a cheekily satirical nod to the deceptiveness of this new technology, the scene is perhaps Clair’s way of saying that while seeing is believing, hearing—particularly in relation to cinema—involves more of a leap of faith: “The truth recorded by the camera is the film’s transcendental truth, it is Clair’s truth. The information proffered by the sound track is not reliable: it often deviates from the camera’s presentation of the happenings” (Dale 641). Whatever the nature of his efforts to find some place in cinema for sound, there can be no doubt as to the fact that Clair’s belief remained firmly rooted in the predominantly visual nature of film; as Lapierre quotes: “[t]he movie, even talking, ought to create methods of expression very different from those employed on the stage. In the theatre, the words bring about the action; what we see is of secondary importance to what we hear. In the movies, the prime method of expression is the picture, and the element of words and sound should not dominate” (265). That the emergence of filmed theatre was perceived by Clair as a threat to the autonomy of his chosen form of artistic expression, then, is of little surprise, its foregrounding of sound over image a direct contradiction of his beliefs as to the medium’s inherent qualities. À nous la liberté, as such, stands as a fitting embodiment of Clair’s own way of cinematic thinking: a progressive piece of work willing to employ the new technology of the time, but simultaneously aware of the shortcomings thereof; an earnest effort to develop sound as an extension of cinematic expression, rather than as its essence. Andrew, Dudley. Mists of Regret: Culture and Sensibility in Classic French Film. Princeton, NJ: Princeton University Press, 1995. Print. Collignon, Jean. “Theater and Talking Pictures in France”. Yale French Studies 5 (1950): 34-40. Print. Dale, R.C. “A Clash of Intelligences: Sound vs. Image in René Clair’s “A nous, la liberté””.The French Review 38.5 (1965): 637-644. Print. Dowrie, Phil and Keith Reader. French Cinema: A Student’s Guide. London: Arnold, 2002. Print. Lapierre, Marcel. Anthologie Du Cinéma. Paris: La Nouvelle Édition, 1946. Print. Entr’acte. Dir. René Clair. Les Ballets Suedois, 1924. À nous la liberté. Dir. René Clair. Films Sonores Tobis, 1931. Marius. Dir. Alexander Korda. Les Films Marcel Pagnol, 1931. The Cabinet of Dr. Caligari (1920) and its contemporaries predate Clair in their own efforts to establish a language of cinema, but interestingly still rely on aesthetic artifice borrowed from theatrical tradition.